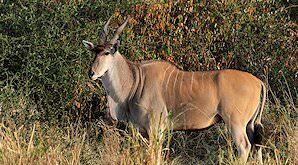 Plains game species that can be hunted in the countries of Southern Africa range from the tiny steenbok to the mighty eland. 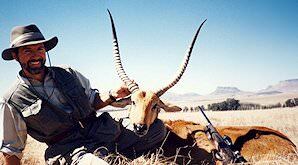 Plains game hunting brings more hunters to Africa each year than all of the Big Five combined. Southern Africa can boast with more species of mammals than any other destination on the globe. 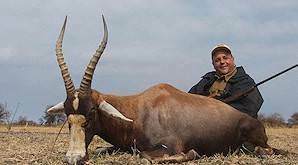 The abundance of antelope species in Southern Africa, and especially South Africa, make it an absolute paradise for those hunters inclined to take medium-sized game. To some, plains game hunting in Southern Africa has remained only a dream, as most perceive it as far too expensive and best left to only the wealthiest of hunters. THIS IS A MYTH! 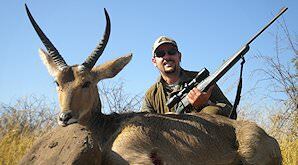 In fact, you can book a very enjoyable plains game hunting safari in South Africa for considerably less than the average elk hunt in the western states of America. 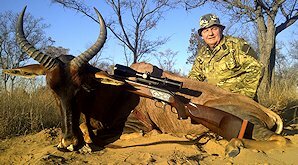 African plains game hunting is conducted in a variety of geographical areas which can vary widely in climate, vegetation, and topography. 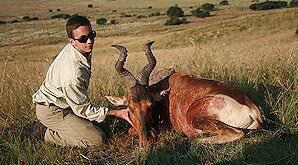 The hunting areas can range from densely wooded savanna to wide open grasslands. Our great diversity of plains game abound from the bushveld of the Limpopo province to the vast open plains of the Free State and back to the sands and heavy thorn bush of the Kalahari. Each of these areas offer a unique habitat, which is ideally suited to the specific plains game species and holds its own special challenges for the plains game hunter. Hunting the bushveld, because of its thick cover, shots can often be taken well inside 100 paces. 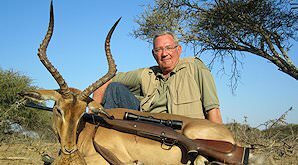 The vast, open plains of the Free State may demand shots out to 300 paces, while the thick thorn bush of the Kalahari can present the hunter with shots at less than 50 paces. The stalk can be extremely strenuous due to the seemingly endless sand. The hunting techniques that we employ can vary based upon the preference of the hunter. It can range from walk and stalk to glassing and hunting from a blind with bow and arrow. A client with a disability or anyone whose physical activity is limited by age or medical condition can hunt from one of our well-equipped hunting vehicles. Black wildebeest are normally hunted on the central plains of South Africa. By the early nineteen hundreds, these animals were almost hunted to extinction. It was only through committed conservation that their numbers were re-established in the latter part of the previous century. 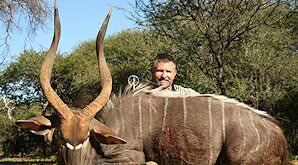 Trophy hunting and the income derived from it is one of the most important contributors to the conservation of the black wildebeest in South Africa. 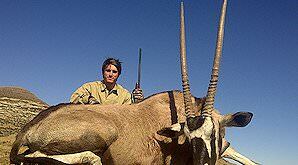 Blesbok are amongst the most common animals that can be hunted in South Africa. These antelope favor open plains where water is available. Long shots are often required when hunting on the open plains in South Africa. Calibers which are ideally suited to hunting these animals are the faster shooting calibers with a relatively flat trajectory. We recommend the .270, 7X57 and the .300 Win Mag. White blesbok are not a subspecies, but rather a color variation on the common blesbok. 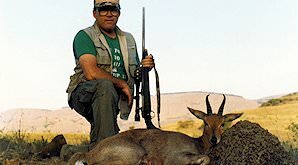 They occur in all areas where the common blesbok are prevalent and exactly the same hunting methods are employed when pursuing the white blesbok. When showcased side by side in a trophy room with the common blesbok, these trophies make quite an interesting display. 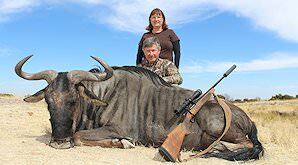 Blue wildebeest are amongst the most popular plains game species that can be hunted in South Africa. Blue wildebeest are often referred to as "the poor man's buffalo", for there are many similarities when hunting this animal and the Cape buffalo - Africa's largest and toughest bovine. 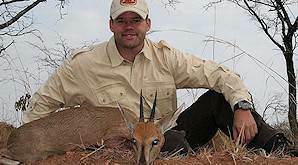 Bontebok are one of the rarest species of plains game that can be hunted in South Africa. They bear a close resemblance to blesbok, with a few unique distinctions. The bontebok has a white blaze that stretches from its forehead to the tip of the nose. They also have a distinct white blaze around the tail. 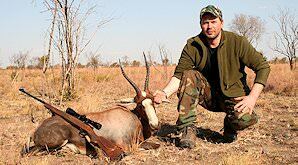 Bontebok are normally only hunted by avid African trophy collectors. 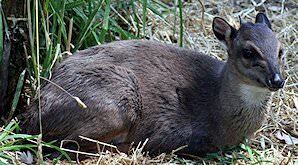 Bushbuck are the smallest of the spiral-horned antelope that can be hunted in South Africa. These antelope can be quite elusive. The males are normally solitary and favor thick vegetation. They are often encountered during the late afternoon in the thick bush surrounding river courses. It is important to be very wary of bushbuck once they are wounded, for they have been known to lie in wait and attack hunters. Bush pig are best hunted at night when these mammals are at their most active. They favor densely wooded areas and have been known to cause a lot of damage in farming areas where they often occur in large numbers. 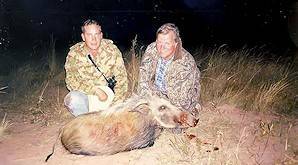 Bush pig can be dangerous and it is necessary to have backup when hunting this animal. Caracal are the most widely spread small cat species in South Africa. 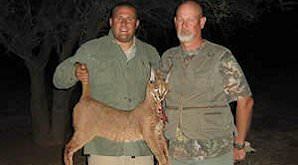 Methods employed when hunting caracal normally include either dogs or predator callers. 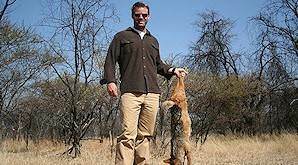 Baiting is not effective when hunting caracal, since they are known not to return to any kills they have made. Common reedbuck are fairly widely distributed throughout South Africa. They are mostly nocturnal animals that are hunted during the late afternoon and early morning. The name "reedbuck" was given to these animals, for they commonly hide in reeds and the tall grass surrounding marshes during the day. Common reedbuck can be distinguished by a white patch under the tail when they are running away. Blue duikers are the smallest of antelope that can be hunted in South Africa. These tiny antelope favor the coastal forests along South Africa's east coast where dogs are used to drive them from the thickly wooded ravines that characterize the area. 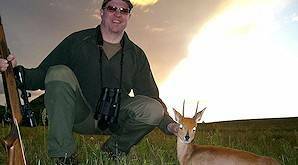 If the blue duiker is what you are interested in, South Africa's Eastern Cape province is where the hunt will be conducted. The grey or common duiker, as he is also known, is among the most common small antelope that can be taken on a plains game hunting safari in South Africa. 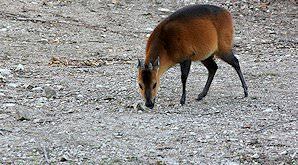 Common duiker occur in all of the areas to which ASH Adventures offers hunting safaris. 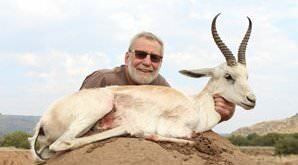 They are normally taken opportunistically when pursuing another antelope. The dashing red duiker can easily be identified by its reddish chestnut coat. These small antelope are found in the forests of eastern South Africa, with the largest concentration occurring in South Africa's KwaZulu-Natal province. Red duiker are territorial antelope best hunted with either a shotgun or solid bullets in a large caliber rifle. 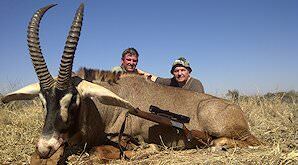 Cape eland are the largest plains game animal that can be hunted in South Africa. 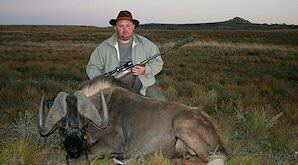 They occur in the bushveld, eastern Free State, and Kalahari regions to which we offer hunting safaris. Large males can easily be identified by their blue necks and large dewlaps. The large males normally have a thick and prominent tuft of hair on their foreheads. The Livingstone eland is not common in South Africa. They are, however, found in certain parts of the lowveld. Livingstone eland can be easily distinguished from Cape eland by the stripes that occur on their sides. 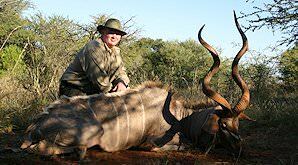 Please be sure to let us know well in advance if you wish to have Livingstone eland included in your plains game hunting safari. Giraffe are the world's largest ruminants and the tallest land mammals. Giraffe have exceptional eyesight and acute hearing, which makes them difficult to approach. 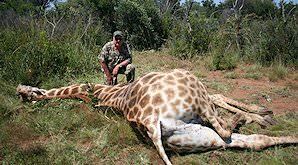 Hunting giraffe will most often be done by spot and stalk or tracking his very distinctive spoor. The giraffe has thick, tough skin and will require the same bullet selection as an elephant. 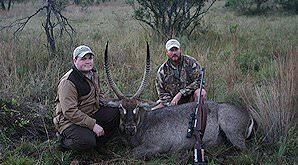 The grey rhebuck is a medium-sized antelope that occurs in mountainous terrain in the southeastern part of South Africa. 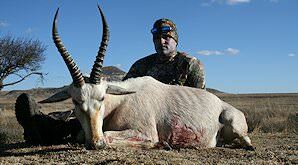 The altitude and terrain where these plains game species are hunted can often create a very challenging hunt. Only the males of the species carry horns, which are straight and upright. Fallow deer were introduced near Cape Town in South Africa in 1869. From here populations were established in the Eastern Cape, Free State as well as the highlands of Mpumalanga. Though not endemic to South Africa, fallow deer can be taken on an opportunistic basis when hunting in one of the areas in which they occur. Gemsbok are one of the most impressive plains game trophies that can be hunted in South Africa. Gemsbok are native to the dry Kalahari region of South Africa. 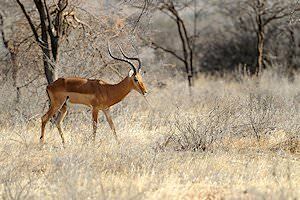 They can go without surface water for months on end, as they derive moisture from the plant material they digest..
Impala are the most common antelope found in South Africa. 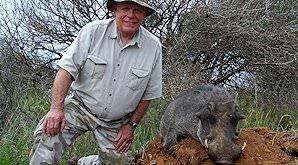 They occur in significant numbers in all of the hunting areas to which ASH Adventures offers safaris. Impala are a very attractive mid-size antelope. 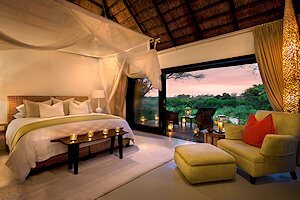 They are included in almost all of our hunting packages and would normally form part of the bag on any safari in South Africa. The black-backed jackal is the most common jackal hunted in South Africa. These scavengers are found on the majority of the farms hunted by ASH Adventures and may often be taken upon sight when the opportunity presents itself. Jackals are considered a pest to livestock and game farmers, as they prey on the young of other animals. Klipspringers are one of the smallest antelope species found in South Africa. They are hunted in areas with rocky terrain or mountain ranges. Their yellow-brown coats provide excellent camouflage in these areas, and they can be very difficult to spot when standing motionless. They should be spotted from below, as opposed to above, as klipspringers are more alert to predation from above. 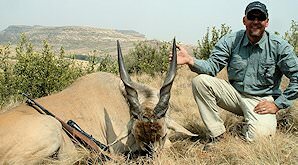 A good set of kudu horns is arguably the most impressive plains game trophy that can be harvested in Africa. Kudu occur widely throughout South Africa, where they favor broken or hilly terrain with thick vegetation. They are very well camouflaged and can be hard to spot when standing motionless in thick brush. Though the red lechwe is not endemic to South Africa, they have been introduced to the Free State and Eastern Cape from populations found north of South Africa. They are a medium-sized antelope and only the males of the species carry horns. They are ideally hunted with a .30 caliber or larger. These medium-sized antelope favor mountainous terrain where they occur in small family groups. Only the male of the species carries horns. 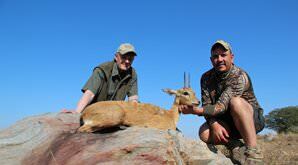 Mountain reedbuck can present a very challenging hunt with a lot of climbing involved. 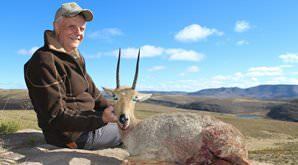 Long shots with varying elevation are often required, and a fast flat shooting caliber would be recommended when embarking on a mountain reedbuck hunt. Nyala are among the most graceful of the spiral-horned antelope that can be hunted in South Africa. Their preferred habitat is the higher rainfall eastern parts of South Africa where they favor densely wooded savanna. 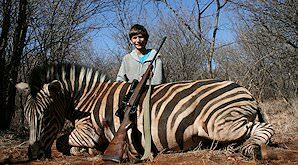 The .270 should be the smallest caliber with which to pursue the nyala. A .30 caliber rifle would, however, be a better choice. The red hartebeest is one of the swiftest antelope on the continent. Hunters have given him the moniker 'Harley Davidson', due to the unique shape of his horns and elongated face. At home on the open plains, the red hartebeest is fatally curious. Your ideal shot is that moment he hesitates before taking off. A good flat-shooting rifle is the order of the day. The number of roan antelope in South Africa has increased substantially over the last decade, as a large number of private breeding projects have led to the reintroduction of these rare antelope into areas where the occurred naturally in the past. They are the second largest of the plains game animals that can be harvested on a South African hunting safari. Oribi are graceful, slender-necked small antelope that are widely distributed across sub -Saharan Africa. They favor open grassland and are found in very limited numbers in South Africa. 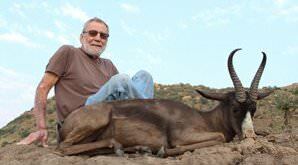 These antelope would normally only be hunted by the most avid of African trophy collectors. The world's largest living bird species also counts among the other species that can be hunted whilst on safari with ASH Adventures. 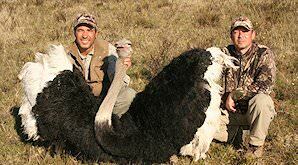 The ostrich is popular for the high quality of its hide, its magnificent feathers and its lean, high-protein meat. Ostriches are also often hunted while in pursuit of other game. Sable antelope are most active during the early mornings and late afternoons. Their distinctive coloring makes them easy to spot, even in the densest vegetation. 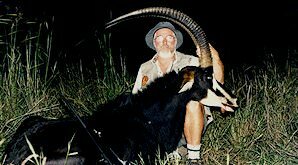 The scimitar-shaped horns of the sable are probably the most prized of all the plains game trophies found in South Africa. The black springbok is not a sub-species, but rather a color variation on the common springbok. They occur in all areas where the common springbok is found. 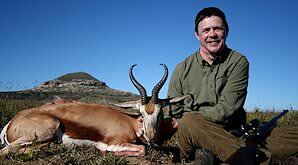 Long shots over open terrain are the order of the day when hunting springbok. Black springbok trophies make a great display when mounted alongside the common, white and copper springbok. The common springbok is the national animal of South Africa. These graceful animals are hunted on open terrain where their exceptional eyesight make it very difficult to get within shooting range. They are best hunted with a caliber with a high velocity and a very flat trajectory. The white springbok is another color variation on the common springbok which can be harvested in South Africa. It is known as a morph species. Like the common springbok, it thrives in semi-arid areas and areas with open plains. Taking the white springbok will add a unique and attractive trophy to your collection. Steenbok are a fairly common small antelope that have a wide distribution in South Africa. Steenbok are territorial antelope and only the male of the species carries horns. 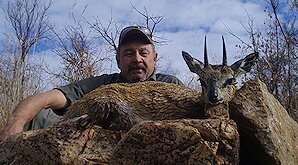 It would be uncommon to hunt specifically for steenbok, as they would normally be taken on a chance encounter while hunting for one of South Africa's larger plains game antelope. Tsessebe have the distinction of being the fastest antelope in Africa. They are part of the same family as the wildebeest and hartebeest. All of which have a strange appearance due to the fact that their shoulders are higher than their hind quarters. 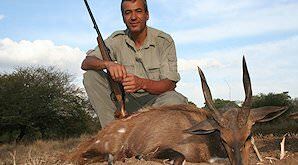 It is recommended that tsessebe be hunted with a .30 caliber rifle and an ideal bullet weight of 180 grains. Waterbuck can be identified by their unique v-shaped horns, shaggy coats and the distinct white circle around their tails. Only waterbuck bulls carry horns. As its name implies, these large species of antelope are never found far from a permanent water source. Warthog are widespread throughout South Africa. This common wild pig's trophy size is typically assessed by its upper tusks, but often also hunted for its rather delicious meat. Warthog are often found around waterholes and pans and like to inhabit the desert dens of anteaters. The Burchell's or plains zebra is the most common zebra that occurs throughout Southern Africa. Revered for their spectacular skins, zebra are typically found on opens plains and grassland areas. Zebra are highly dependent upon water and will never stray too far from a water source. The Cape mountain zebra is slightly smaller than the Burchell's and lacks its cousin's distinctive shadow stripe. Its underbelly is also completely white and it bears a dewlap on its throat. 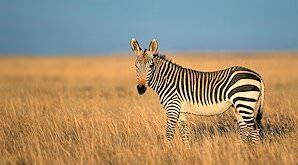 Mountain zebra are typically hunted in the Eastern Cape, where they occur historically.